On Dec. 2, 2015, the Atlas V rocket carrying the Orbital ATK Cygnus spacecraft was rolled out to the launch pad, in preparation to deliver cargo to the International Space Station. People in the eastern United States might be able to see a private cargo spacecraft launch toward the International Space Station on Thursday evening (Dec. 3). 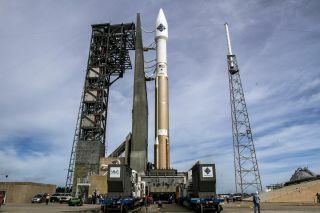 Orbital ATK's uncrewed Cygnus freighter is scheduled to blast off atop a United Launch Alliance Atlas V rocket from Cape Canaveral Air Force Station in Florida on Thursday at 5:55 p.m. EST (2255 GMT). You can watch the launch live here at Space.com, courtesy of NASA TV. The Cygnus' path to space will take it nearly parallel to the U.S. East Coast on Thursday, so the glow created by the two-stage Atlas V's engines should be visible in varying degrees along much of the Eastern Seaboard, weather permitting. The Atlas V's first stage is powered by a single RD-180 engine, which will burn for 4 minutes and 15 seconds before shutting down. Six seconds later, the rocket's first and second stages will separate. Ten seconds after that, the second stage — the Centaur, which utilizes one RL 10C engine — will be fired, and will burn for 13 minutes and 45 seconds. The Cygnus spacecraft will separate from the upper stage 2 minutes and 49 seconds later and head into orbit. The Atlas V first stage should create a fairly conspicuous light in the night sky, while the second stage's glow will likely be considerably dimmer. The Orbital ATK Cygnus spacecraft undergoes encapsulation in the Atlas V rocket fairing at NASA's Kennedy Space Center on Nov. 16, 2015. The launch should be readily visible in much of the southeastern United States, thanks to the fiery output of the Atlas V's first-stage engine. The light emitted will be visible for the first 4 minutes and 15 seconds of the launch out to a radius of about 500 miles (800 kilometers) from Cape Canaveral — an area about three times the size of Texas. Depending on where you are located relative to Cape Canaveral, the Atlas V might become visible just seconds after it blasts off Thursday, or up to 4 minutes or so later. After the first stage shuts down, the Atlas V will be quite a bit dimmer. Just how much dimmer? A comparison with the glow produced by SpaceX's Falcon 9 rocket, which launches the company's Dragon capsule on cargo missions to the International Space Station (ISS), might be instructive. Southeast U.S. coastline: Anywhere north of Cape Canaveral, viewers should initially concentrate on the south-southwest horizon. If you are south of the Cape, look low toward the north-northeast. If you're west of the Cape, look low toward the east-northeast. Mid-Atlantic region: Look toward the south about 3 to 6 minutes after launch. Northeast: Focus your gaze low toward the south-southeast about 6 to 8 minutes after launch. Nova Scotia and Newfoundland: Concentrate your gaze low toward the south-southwest about 8 to 10 minutes after launch. For most viewers, depending upon your distance from the coastline, the rocket will be relatively low on the horizon — about 5 to 15 degrees. (Reminder: Your fist on an outstretched arm covers about 10 degrees of sky.) So be sure there are no buildings or trees to obstruct your view. The exceptions are along the immediate Atlantic coast of Nova Scotia, where the Atlas V will be seen to climb rather high into the southeast sky, and the Avalon Peninsula of southeast Newfoundland, where it will pass almost directly overhead. Because the rocket will likely appear rather small and fuzzy, scanning the sky with binoculars can't hurt. Also keep in mind that the vehicle likely will appear to move very fast, much faster than a satellite, due to its near-orbital velocity at low altitudes. The Atlas V will basically travel across 90 degrees of azimuth in less than a minute.